These thin, narrow, lightweight, heat resistant polyester fiber strands can be washed, cut, curled, flat ironed or blow dried. Like with any tinsel they can slide out of your hair if you don't tie them well enough or if your hair is super fine. It does take a bit of practice but once mastered you won't regret the time spent. These are super fun to wear! Step 1. Create a slip knot: Select a strand of hair tinsel and create a small loop. Pull the end of the tinsel through the loop completely. Step 3: Tie few more knots with the tinsel only. The finished knot should be at the base of hair, small and flattened into the hair. ::Quantity: 7 colors x 30 strands each. Total 210 strands. 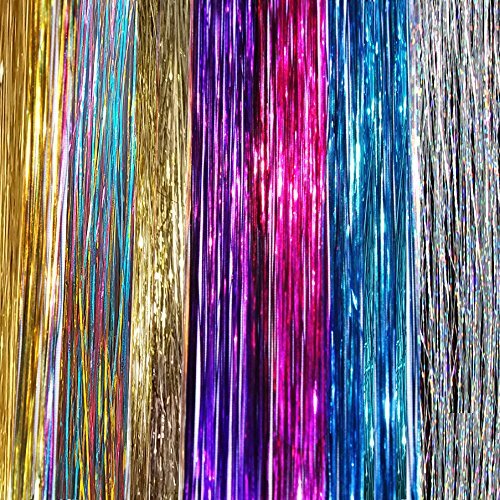 If you can tie a knot, you can install this hair tinsel! With care, tinsel hair can last several weeks, even through washing, drying, and flat ironing. For long lasting effect use 3 - 5 strands of hair when attaching tinsel and do 2 or 3 knots with the hair and the hair tinsel. It might be easier if the hair is dump. Adding a little bit of dry shampoo to the root can add a texture to hair and prevent tinsel sliding down. If you have any questions about this product by La Demoiselle, contact us by completing and submitting the form below. If you are looking for a specif part number, please include it with your message.